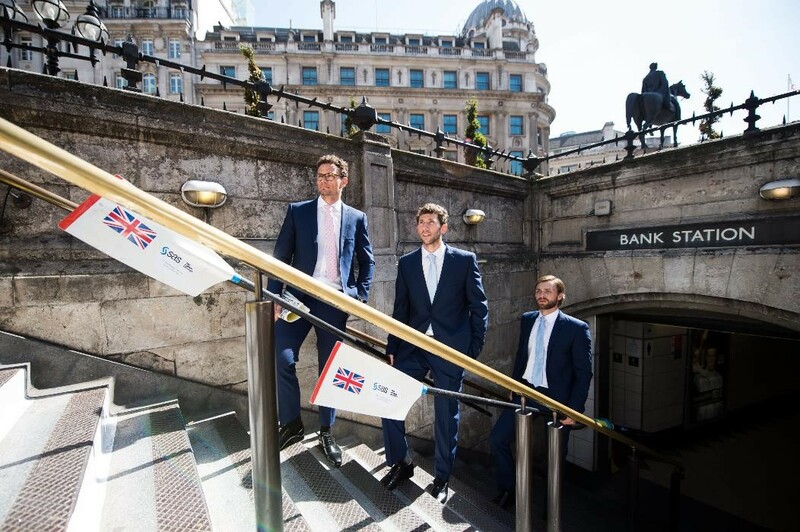 Having returned to Britain after medalling at the World Rowing Cup II, in Linz Ottensheim, Austria; Joshua Bugajski, Matthew Tarrant, and Oliver Wynne-Griffith, who rowed together in the men’s eight, arrived dressed for the City, only to reveal the new all-in-one kit once at SAS’ London base. Tarrant and his fellow crewmates will next be in action for the GB Rowing Team at the World Rowing Cup III, in Lucerne, Switzerland, on 13-15 July 2018. Image one: GB Rowing Team athletes (L – R) Joshua Bugajski, Matthew Tarrant and Oliver Wynne-Griffith launch the new, SAS-branded GB Rowing Team competition kit. SAS is the leader in analytics software and services, and Official Analytics Partner of British Rowing. Image two: GB Rowing Team athletes (L – R) Matthew Tarrant, Joshua Bugajski and Oliver Wynne-Griffith launch the new, SAS-branded GB Rowing Team competition kit. SAS is the leader in analytics software and services, and Official Analytics Partner of British Rowing. Images three and four: GB Rowing Team athletes (L – R) Oliver Wynne-Griffith, Joshua Bugajski and Matthew Tarrant launch the new, SAS-branded GB Rowing Team competition kit. SAS is the leader in analytics software and services, and Official Analytics Partner of British Rowing. Over 825,000 people row, indoor or on-water, each month according to Sport England’s year one Active Lives survey.